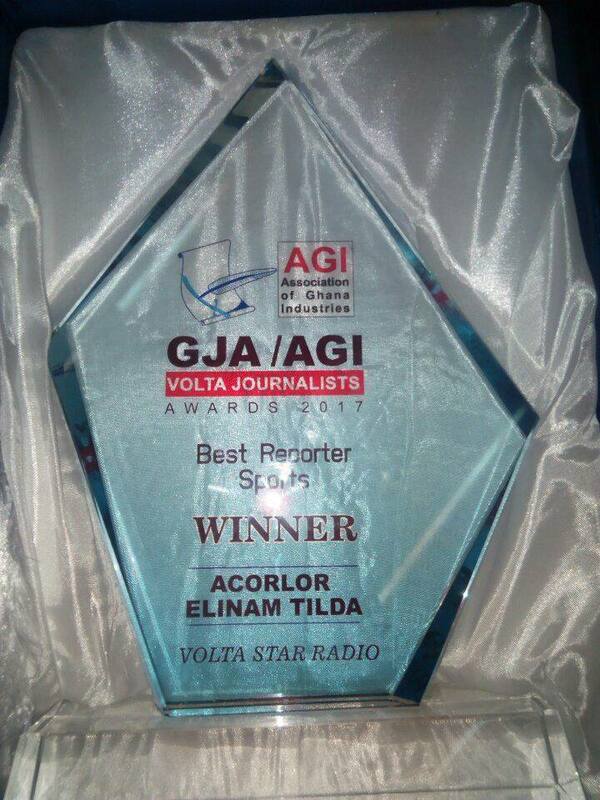 GBC Volta Star Radio’s Tilda Elinam Acorlor emerged the Volta Region’s Best Sports Journalist of the year, at the Ghana Journalists Association’s maiden awards for the Volta region. The award which was instituted by the regional branch of the association and in partnership with Association of Ghana Industries (AGI) aimed at awarding and celebratiung hard working journalists in the region. The only notable female Sports Journalist in the region, tendered in the article “Reviving Women Football in The Volta Region” to beat off competition among others. A feature story that assessed the growth and difficulties female footballers, clubs and team administrators go through in keeping up the pace set with other regions. Miss Acorlor joined GBC Volta Star Radio in 2013 after graduating from GBC training school on attachment. She joined the sports desk headed by Eric Eli Adzie who developed her love for the discipline. She worked tirelessly to bridge the gap between the marginalized and their love for the female sport. Her hard work outside the corporation had also earned her a position with the Regional Football Association as the secretary to the Women Football Committee. The ceremony was attended by distinguished personalities including the Information Minister, Mustapha Hamid, Hon. Kojo Yanka and the Volta Regional Minister, Archibald Letsa. A media fund for journalists in the region was also launched at the ceremony. The awards happen to be the first of its kind by a regional branch of the GJA.